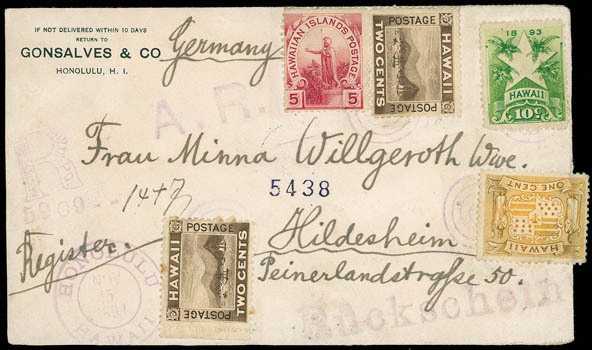 Gonsalves & Co, Honolulu, H.I., printed corner card on cover bearing 1¢ yellow (74), two 2¢ brown (75) singles, 5¢ rose lake (76) and 10¢ yellow green (77), all tied by four-ring cancel to Germany, matching purple "Honolulu, Hawaii, Nov 15, 1891" cds with "A.R." and "Registered, Hawaii P.O." handstamps, return address of "H. Willgeroth, Eleele Plt. 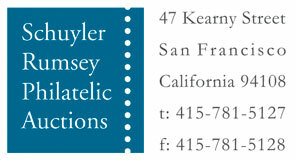 Kanai", San Francisco (11.22), New York (11.28) transits and Hildesheim (12.9) arrival cds, Very Fine. Peters-Uota No. GC-HS-1 Estimate $300 - 400. A link back to Sale 65 - Lot 329, along with its description, will be appended to your message.